We have followed the weather forecast carefully and have decided to open the Plant Scheme for the season from Saturday 20th April. We will open each Saturday and Sunday from 10 am to 12 noon. Please be aware that tender plants must be kept in an indoor area or greenhouse until the danger of frost has passed, usually the end of May. Hardy plants for immediate planting include broad beans, sweet peas and edible peas and some brassicas. A full range of plants including the ever popular courgettes, cucumbers, squashes and many many more as well as flowers will become available. Even if you have no greenhouse, do come to see us and the many varieties ready and forthcoming during the next few weeks. Those of you who attended the AGM at the end of January 2019 will have heard the presentations on behalf of a small group of plotholders who were interested in setting up, maintaining and managing a community plot on a cleared site on the middle lane. The project was to provide a communal space for the social benefit of Moorside Allotment Association gardeners, family and friends, to enjoy events organised by the group throughout the year. The site would be cultivated in line with our accepted Cultivation Standards. It is difficult to give the members enough detail on the proposal without a trial period and allowing the group time to scope out the project. There is a possibility that the plot may not be a success even if approved. Therefore your Committee has asked the group interested in the project to continue clearing the plot and to operate it for a trial period of a year. This will then enable us to come to next year’s AGM with a detailed proposal, following the 2019 social and revenue-earning activity on the site. At that point, members will be in a position to consider supporting the proposal in the light of the evidence that the project could be workable. In the meantime, the community plot group would like to send email updates to Moorside Allotment Association members regarding progress and advance notice of events. If you would prefer not to be contacted in this way, please let us know. Through the Newcastle Allotments Working Group, allotments across the city have received an invitation from Ruth Davies, the Producer/Director of BBC 2’s Gardeners’ World who is looking for stories she can feature in the new series. Says Ruth ‘We will be making several films about allotments this year, with our presenter Frances Tophill. She will be visiting inspirational, unusual and challenging allotments around the country to gather ideas and advice for her own allotment in Kent. I am also looking particularly any allotment holders who might be good for us to speak to. We are looking for people who have buckets of experience and/or enthusiasm. For example, perhaps they have an allotment specialism – like growing particular types of fruit or vegetables. Or a passion for making their allotment wildlife-friendly, alongside growing great produce. Perhaps they have won an award – or just been working for a very long time on the same plot! Here on Moorside, we have some prizewinning gardens and longstanding top notch gardeners, so if any of you feel you would like your garden featured on Gardeners’ World, let the Committee know and we will forward your details to Ruth for consideration. Chairman, on behalf of the Committee. Forthcoming Artwork Sale Of The Late Moorside Plotholder, Donald James White. It was with sadness that we forwarded the news last year of the unexpected death of one of our plotholders, who we knew on site as James White, though known to his many local friends as Donald. In addition, few of us were aware that he was a talented and prolific artist, especially in his native Scotland, with close links to the Glasgow School of Art. We have now learned that a sale of Donald’s work is due to take place at the premises of Thomas V Miller Auctioneers, Algernon Road, Newcastle upon Tyne, NE6 2UN on 2nd April 2019 at 10 am. Viewing is on 31st March and 1st April 2019. Several of us had expressed an interest in Donald’s work and for more information, there is a link to the auction at https://www.millersauctioneers.co.uk/auctions/ An online catalogue should be available soon. We understand that if registered in advance, online bidding is available either live or by placing a bid beforehand with the auctioneer. Thank you to those of you who followed our advice and contacted the local Police after the spate of burglaries last month. Our local Neighbourhood Police contact Stacey Reilly 2457 has now been switched to another patch but her Fenham beat successor has introduced himself as the new person to deal with. PC Daniel Jackson 3007 has taken over as our Constable Neighbourhood Beat Manager working out of the Central Office on Westgate Road. Dan has advised me that the preferred method of reporting crimes on our site is for each individual plotholder to do so via the Northumbria Police website and report the incident online, at the same time giving all the details listed below. - You will need to give your name, DOB. Home address, telephone number, Moorside Plot Number, items taken/damaged and how entry has been gained. I realise it might seem a bit laborious but I now understand this is the Police preferred option as they do not have time to take all the details over the phone or via individual emails. In the meantime, I am in touch with PC Dan Jackson and hope to show him round the site shortly so that he is familiar with Moorside. Naturally, let me or another Committee member know if your plot has been subjected to intruders, so we can log the incident as well. Plot 28. Shed doors left open but plotholders still to be asked if anything has been disturbed or missing. Plot 47 Shed open but as it does not close properly it is impossible to say whether it has been entered. Plot 48 Gate had been opened. Plot 51.. Two sheds open. Sieve missing but retrieved from Plot 50. Plot 53. The gate was open but nothing seems to have been taken. Pot 54.. Shed door open but nothing taken. Plot 56. Shed door open. Plot 59.. Shed door opened and spade left outside, which has now been put back inside the shed. Plot 59. Shed open. Now closed and gate secured. Plot 60a/b. Shed open but gate still secured with a spade handle, so this may be a red herring! Most gardens at the top of this lane had the gates left open, indicating that the villains had been in to each one. Plot 86. The doors on both sheds were opened but nothing seems to be missing. Plot 87. Shed door open and items strewn all over the garden. Plot 92. Gate and shed door open. Plot 89A. Shed door open. Some tools and a bucket are missing. Plot 93. Gate open but the locked shed had been left undisturbed. Plot 95. Shed door open. Plot 96. Shed door open. Plot 97. Shed door open. (This plot has two bee hives as well). A plastic can of paraffin (the can was marked Moorside Allotments, so has been bought from the shop) was also found abandoned near Hameed’s garden. It is now in the shop awaiting its owner. forms available from the Moorside shop. Moorside volunteers have donated £50 to Cancer UK from the sale of scrap metal found during the clearance of our proposed Community Plot. Pictured: Eddie Gilchrist and Fareed Yousefi. A big thank you to our ‘Bonfire Night Team’ who put on such a splendidly well-organised and enjoyable evening on 2nd November. An added bonus was a mild, dry and breeze-free night! From the enormous bonfire to the delicious barbecue, coupled with superb lighting and security systems, it went off superbly. Everyone who attended was most complimentary and the event attracted a lot of local residents as well as a good many of our Moorside gardeners. And even better, from the sale of refreshments and Moorside jam during the course of the evening, the net proceeds have been added to Association funds. Well done, everyone! Over the last month or so, we have once more experienced an ongoing series of break-ins and thefts of equipment from sheds, dating from mid October onwards. The Police have been informed of individual incidents and a list of items stolen, where known. However, they have emphasised that each plotholder should inform them separately so that the information can be added to the Police incident log. In this instance, the officers involved have been PC 3039 Helen Swanson, our community liaison police person and PC Andrew Cox who is stationed at Etal Lane. To report any incidents on your plot, please make it a priority to telephone 101 and inform the authorities of the disturbance and any items missing. We have an incident/Log number – 285 of 18/10/18.The Police would welcome any information to help catch the culprits. 21st October - Thompson & Morgan Seed Catalogue, And Trading Hut Up To Their Necks In The Brown Stuff! The Thompson & Morgan Seed and Plant Catalogue 2019 is in the shop for anyone wanting to take advantage of their Allotment Society prices. Purchasers receive 50% discount off seeds and 20% off non-seed items. Just collect an order form, complete it and drop it back in the shop with the payment before 30th November 2018. Any queries, contact Susan Pownall, Shop Manager. Many of you will have heard already the sad news that Moorside gardener, fellow Committee member and also one of our shop volunteers, Ringo Gebbie has died tragically in a snorkelling accident whilst on holiday on the island of Rhodes. His wife Angie and family have now let us know that his funeral is taking place at 2 pm on Tuesday, 18th September at the West Road Crematorium, followed by a burial; and afterwards at the Benwell Cricket Club across the road from the Crematorium. They look forward to Ringo’s many friends and colleagues joining them in memory and celebration of his life. Despite some worries about the overall fate of the hedgehog across the country, some night time video filmed by Tony Whittle has confirmed that there are definitely hedgehogs active on Moorside. 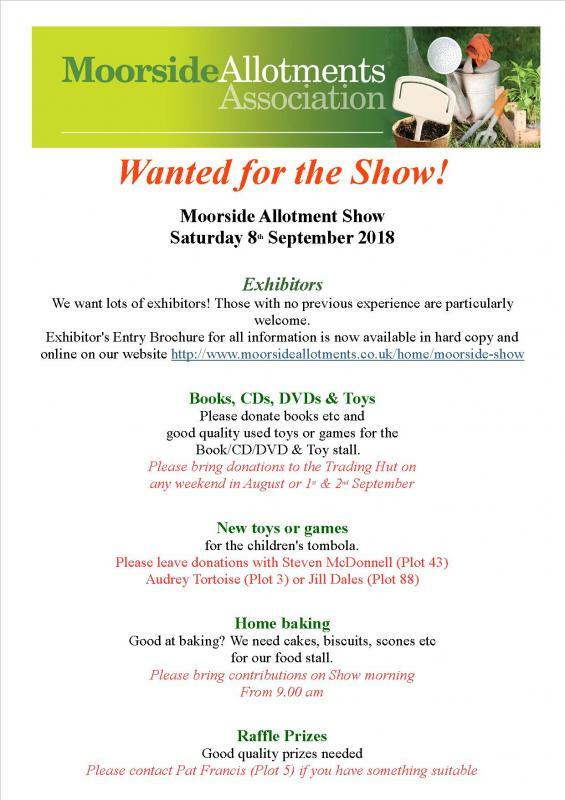 The Moorside Shop, normally open between 10 am and noon each Saturday and Sunday, will be closed completely over the weekend of 8th and 9th September as the Association is holding our Annual Show and Produce Competition on Saturday 8th September and the shop area is being used for show administration. However, we will resume normal service on Saturday 15th September, when we look forward to welcoming customers old and new. Susan Pownall. Moorside Shop Manager. Please donate any surplus fruit and vegetables which we can sell for the benefit of city allotment funds at the city allotments show next weekend. Any produce not sold will be donated to local foodbanks, crisis, people’s kitchen etc. The Moorside Show is now just 2 weeks away, and the the Show Brochure is now available to download. Entry cards for the show must be handed in by 2pm on Friday 7th September. Budding gardeners and green-fingered enthusiasts are invited to show off their gardening skills once again at the annual Newcastle Allotment and Garden Fete, organised by Newcastle City Council in partnership with the city’s Allotments Working Group (NAWG) . There is a small charge of £3 per exhibitor and for this you can enter as many classes as you wish, children’s classes are free. Prize money will be awarded to the best exhibits on the day, so please feel free to enter prior to staging on Saturday 1st September (see attached schedule). The public show starts at 11am on Sunday , when the main marquee will be officially opened by the Lord Mayor of Newcastle (Cllr David Down) and finishes at 5pm. All entrants must stage their exhibits on Saturday 1st September between 10am - 4.30pm, ready for public viewing on the Sunday. We know that the ongoing dry weather this summer has been less than beneficial for our valued crops and we have needed to use hosepipes and sprinklers, sometimes on a daily basis to keep our plants alive. However, there have been several instances where plotholders have persistently turned on their hoses or sprinklers for hours on end and have also left the site with the water still running, even after being advised that the practice is out of order. Sorry, folks – this is totally unacceptable! Not only is it running up an enormous water bill which we all share equally as part of our rent but also the pressure is much reduced for those ‘normal’ users who are unable to access even watering cans without problems with low pressure. Please ensure, therefore, that all hosepipes and sprinklers are turned off before you leave the site and devices are also disconnected from the tap. It is with great sadness that we have heard of the unexpected death of one of our gardeners, Mr James White. James had only been gardening on Moorside for a couple of years but he quickly became one of our Moorside ‘characters’. Because of ill-health, he had decided to give up his plot at the end of the summer, so it is doubly sad that he was not able to enjoy the fruits of his labours this season. James, with his soft Scottish accent, was a talented and prolific artist and was well-recognised in his native Scotland. He lived quietly in Curtis Road, Fenham, where he is remembered with great affection by his friends and neighbours. Here on Moorside too, his presence will be missed, particularly for his eccentricity and his individualistic approach to his garden. James's funeral is being held at the West Road Crematorium at 1.15 pm on Friday, 17th August; and afterwards at the Cricket Club opposite the crematorium. Our annual in-house competition, which comes with an award for the winner in each category, is judged with the help of an external and impartial gardening/allotment expert. The winners are presented with their awards at our Moorside Annual Show which this year is being held on 8th September onsite. You can read more details about the Show as they come through by clicking on the relevant link on our website or looking at the Show Notice Board to the left of the main gate. The winners in each of our competition categories also go forward as nominees in thehighly competitive City Allotments Competition, competing against gardeners from 67 sites across the city. Best Full Plot with Glass Stan and Audrey Tortoise, Plot 3. Best Full Plot without Glass Nick and Gina Coster, Plot 103. Best Newcomer Patti Haes and Maria Irving. Plot 48. Most Wildlife Friendly Garden Frank Lightfoot. Plot 65a. 66. 73a. Most Bee-Friendly Garden David Vincent. Plot 9. (not a City Competition category). Best Organic Plot Ann Gibson and Lat Allman.Plot 99. Well done, everyone and thank you for showing the rest of us how it’s done! 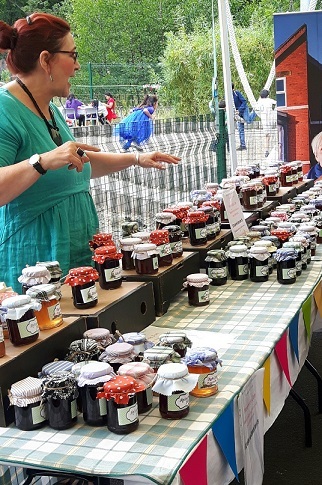 Beverley Sawyer and her Jam Mafia team represented Moorside at the Festival of Diversity in Nunsmoor Park on 7th July with their homemade jam stall. All the jam was made with produce donated by Moorside Allotmenteers and Beverley made over £113 on the day. 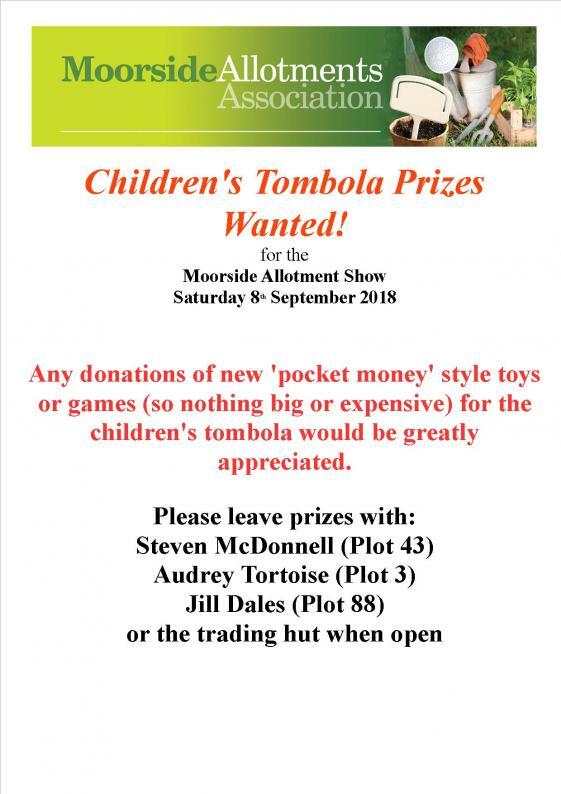 All funds will go into the Moorside Allotments Association funds. For more details, contact Newcastle Allotments Officer, Mark Todd, on 0191 278 7878 or visit Newcastle City Councils webpage for more information. 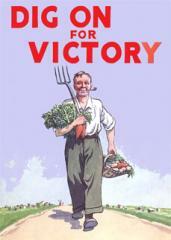 IT’S ALLOTMENT COMPETITION TIME AGAIN! How quickly a year goes! Once more it is time to spruce up our gardens big-time, trim hedges and overhanging briars, tidy up your outside borders and keep those weeds under control. Why? Those coveted prize garden categories are being scrutinized by our Moorside inspection team during the last few days of June, so if you want a chance to be Best Newcomer, Best Organic Gardener, the Owner of the Most Improved Plot – amongst the many other prestigious categories – now’s your chance. If you’re looking for inspiration, glance at the notice boards to see who won last year and take a look over the garden fence! What’s more, during the week beginning 11th July, the City Council representatives will also be inspecting our allotments with a view to seeking out the best in the City in their prize winning categories, so there is much more to play for! Besides competitions, every plotholder on Moorside has an obligation to keep your gardens cultivated and well-cared for. With a waiting list of around 34 potential gardeners, it’s a question of USE IT OR LOSE IT, so make that your incentive to love and nurture your garden. The Newcastle Allotment Working Group forum will take place on Tuesday 19th June in the Collingwood Suite at the Civic Centre 7.00 pm- 8.30 pm (please see attached), with area rep voting taking place at 6.30pm. The forum gives all allotment holders across the city the chance to get together, share information about gardening, plant varieties, and on site projects, along with sharing advice and tips. At 7.10pm, Newcastle City Council Officers, Tony Durcan, Farah Hussain, Narindar Bhabra and Gerardine Fagan (Project Team) will be in attendance to provide an update on the latest position with the set-up of the Charitable Trust and to respond to any questions and concerns you may have as allotment holders. They will also share and ask for comments on the latest ideas for the Community Representation Group which the Trust will be required to set up. Free parking at the rear of the Civic Centre. Each year we have one or two evenings for those who find it difficult to come at the weekend, or just would like to pop in after work. We will be open on Thursday 7th June from 6.30 pm to 7.30 pm. There are a few left of the plants shown below but we are also still producing Runner Beans, French Beans, maincrop Peas and Mangetout Peas (including a rather nice one as shown on Gardener's World). Stocks are limited. We look forward to seeing you on Thursday, but we will still be here on Saturday and Sunday between 10 am and noon as usual. Welcome to the 2018 Plant Scheme. Our opening day will be Saturday 21st April. The first hardy plants ready to plant out are broad beans, early peas (edible) and sweet peas (ornamental). Why don’t you come to see us and all of the other seedlings we are getting ready for you when the weather should have settled? Although we are having some lovely days there could be some sharp frosts ahead so we have to take the possibility into account. 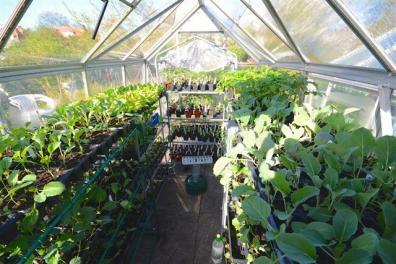 We are growing the usual range which includes brassicas of all kinds, tomatoes, chillies, courgettes and squashes. And the rest! We are looking forward to the 2018 season and hope to see you soon. As Spring (allegedly) gets going, we have now reached the end of bonfire season; and no bonfires are permitted on plots until November. Conversely the water supply is now back on, which also means the toilets are open again for those alternative calls of nature. As is traditional, Moorside marks Easter by obtaining a skip for use by plotholders which will be delivered on Thursday 29th March. Please empty compost bags and sacks of rubbish into the skip (this allows the contents to settle and maximises space in the skip). 23rd February - Trading Hut Out Of Hibernation! Last nights AGM ratified the 2017 Minutes which can be found here. Finally (and most importantly), as we move slowly into the 2018 growing season, the shops supply of seed potatoes have arrived. More details can be found over on the Trading Hut pages - buy quickly to avoid disappointment! Further issues have been identified today, withmore sheds and gates open and equipment scattered around – this time the intruders appear to have targeted the East Lane. This constitutes four break-ins in as many nights, and the police will now be actively patrolling including inside the site. Once again, if anyone has lost anything, we are collecting all the equipment found thrown in gardens, hedges and on the paths and storing the stuff in the shop for inspection. It is with great sadness that I have to report the death of Harry Carter on 18th November. Harry, who retired from Moorside a couple of years ago due to increasingly poor health, had been a longstanding member of our Association over many years. A familiar figure on-site, he had served in various roles on Moorside, where one of his greatest achievements was the introduction and management of our Trading Hut. Harry was also responsible at one time for plot lettings and it was from him that I proudly and enthusiastically received my own garden and a key to the gate 10 years ago! 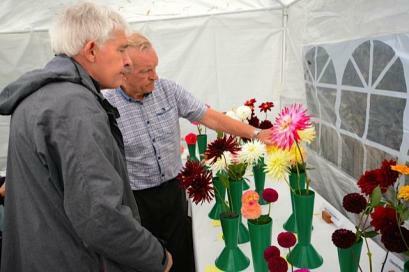 Harry and his wife Ethnie were keen, successful and prize-winning gardeners of a large plot ‘on the front row’ of Moorside and following their ‘retirement’, we were pleased to welcome them on several occasions subsequently, including our annual show. Harry’s funeral is taking place at 10.30 am on Wednesday, 6th December at the Crematorium on the West Road, when Ethnie and the family hope their many Moorside friends are able to attend. They would also be very pleased if everyone would join them afterwards at the Cricket Club for refreshments. The Club is directly across the road from the Crematorium and there is ample parking. Harry’s widow Ethnie has asked me to pass on many thanks to all their friends from Moorside who went to Harry’s funeral on Wednesday. She was so pleased to see so many of us there . Her only regret was that she was unable to get to speak to everyone at the reception afterwards. As she so rightly remarked – time went by so quickly and it was not possible to get round the large gathering. She has asked me to convey her apologies if she missed you out. As of 2nd December, the Trading Hut will be going into semi-hibernation over the winter: Opening hours will be 11am to midday on Saturday & Sundays until mid-February. However it will still continue to stock all your winter gardening needs - paraffin, manure, birdseed, and more. Normal service will resume in mid-February coinciding with the delivery of the seed potatoes. In the meantime, the updated Trading Hut Rota and Revised Price List has been published. Trading Hut News: We took in a large delivery of cow manure on 10th November, which will continue to sell at £1 a barrow, purchasable between 10 am and noon from the shop volunteers each Saturday and Sunday. We have also bought a trial quantity of 75 litre sacks of bulb/hanging basket compost. Made by Levingtons, it apparently contains 6-months worth of nutrient. It will retail at £7.50. The shop is also re-stocked with multi-purpose and seed composts, landscape pegs, chicken pellets and Grow-Organic fertilizer. In addition, we have pre-ordered our annual seed potato requirement for 2018. We expect delivery in late January, early February and will have a good selection across First Earlies, Second Earlies and Maincrop. Come to the shop before going anywhere else! 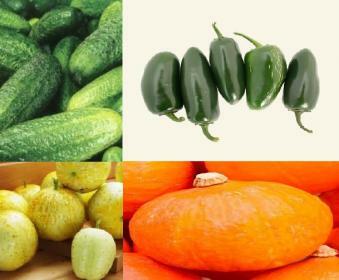 Our prices are very competitive and we’re trying a few new varieties this time, in addition to the usual favourites. Water Supply Switch-Off: Although the weather has been particularly mild so far this season, we plan to turn the water off completely over the next few days. Therefore, this weekend gives you an opportunity to fill up your water butts, if necessary; plastic cans and any other water gathering container you may wish to fill before the middle of the week commencing 13th November. The toilets will be similarly turned off and locked for the winter. Would you like some FREE soil conditioner (enriched with compost and/or manure)? A Revised Trading Hut rota is now available - volunteers always welcome! We are pleased to have negotiated a 20% discount with Quay Timber on all hardware – anything from a screw to a saw! In addition, Quay Timber is offering a 5% discount off timber, roofing materials, gravel boards and such like. 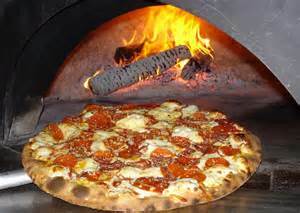 We have done this by setting up a Moorside Account and all you have to do is quote the account number when ordering. For security reasons, you can access the Account Number at the Moorside Shop. Purchasers are responsible for payment directly to Quay Timber for all goods. Delivery to Moorside is extra and is a flat charge. Your contact at Quay Timber is Anthony. Quay Timber Shop hours are 7.30 am to 4.30 pm Monday to Friday. 8 am to 2 pm Saturday; 10 am to 2 pm Sunday. I hope those of you who were able to get to our annual Open Day and Show enjoyed the occasion, which once more proved most successful with a good crowd, despite the cool weather. However, the rain held off and the sun actually appeared later, which was amazing. The event can only happen with the dedication of the Show Group, who year after year, plan, source desirable raffle prizes and orchestrate for months prior to the show to make sure it runs like clockwork on the day. In this regard, enormous thanks are due to Pat, our Show Secretary and her team. Not forgotten in the Association’s grateful thanks are all the helpers who put up tents, dress the competition area, set up tables, stalls, fill the colourful planters, grow plants, bake cakes, make jam, polish trophies, provide the PA systems – the list never ends! And on the day, thanks too to the plotholders, who man the stalls and the Welcome table, run the raffle, entertain the children, provide the delicious BBQ and refreshments as well as those of you who remain behind to help clear up after everyone has gone. The competition entries were once again of top quality and beautifully displayed, perhaps due to the educational videos put together by two of the Show Group – Frank and Steven – which have gone viral on social media! Most of all, thank you to all the Moorsiders who came to support your Association on the day. The Show is the one opportunity in the year when we are able to get together socially and from the feedback we have received, everyone had a really good time and left with some lovely souvenirs of the event purchased from our varied stalls. On to the serious stuff! The Show provides the platform to present our annual awards as well as prizes to those of you who come top in the produce competition on the day. They say a picture speaks a thousand words, so our photographic gallery of prize-winners, snapped by resident photographer Tony, will see some familiar faces who are proving unbeatable year on year, as well as some new gardeners who promise to be serious contenders for the top spots in years to come. Best Half Plot Trophy: Andrew Moat. Best Newcomers Trophy: Ringo and Angela Gebbie. Best Wildlife Friendly Plot: Sue Brophy. Best Group Project: The Grow School Garden. 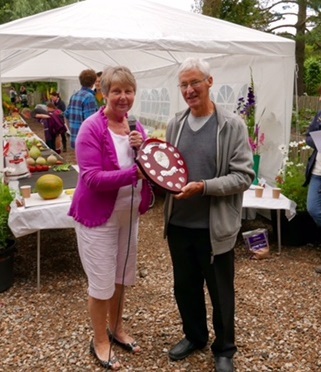 We were also delighted to present at the Show a Long Service Award to one of our seasoned gardeners, Frank Lightfoot, in the shape of a Waterford crystal vase – most suitable for displaying examples of his prize-worthy Dahlias! Many congratulations to Frank, who is one of our Moorside ‘characters’ and who holds a wealth of gardening information for anyone needing advice. Our Annual Unsung Hero shield, awarded in memory of former Chairman Trevor Storey, went this year to our very own Queen of the Jam Pan, Beverley Sawyer, who begs us constantly not to waste our surplus fruit as she can turn it into a variety of individually tasting preserves for sale through the allotment shop and at the show, all to raise funds for the Association. Well done, Beverley! Your fame is spreading, if you excuse the pun, and we understand that to date in 2017 and still producing madly, you have already made - and the shop has sold - over 300 jars of jam! Beverley is always on the lookout for surplus fruit, jars and even pretty material with which to make the colourful jam pot covers, so just leave your donations on the table outside the Moorside shop, marked for her attention. Moorside Champion Gardener Shield, awarded for the most points in show: Stan Tortoise. Best Exhibit in Show (for his onions): Tony Francis. Junior Master Gardener Shield: Anthony Wood. 1st Prize – Salad Bowl: Stan Tortoise. 1st Prize – Top Tray: Stan Tortoise. 1st Prize – Top Vase: Audrey Tortoise. Best for Fun: Tony Francis. The tents are all dry and put away for another year, the tables and benches stacked and stored, while remaining books and toys have been taken to one of the City’s key charity organisations to raise funds for deserving causes, so your contributions are never wasted. Watch out for details of our 2018 event on the website and on the Moorside notice boards, so if you were not able to come along this year, make a firm entry in your diary to come along next year. AND. If you are able to help with the Show, even better! The Moorside show is now just 3 days away, and the Show Brochure is now available. Exhibitors have until 2pm Friday to submit their entry forms (forms available in the Entry Brochure). Leaf Mould available free of charge from St James’ and St Basil’s Church, Fenham. Please contact Jean Hannon on 0191 274 6252 to arrange collection. Beverley Sawyer, our resident Moorside Jam Queen, is urgently seeking seasonal fruit, e.g. plums, apples (even windfalls) to make jam for the Moorside Show. The Moorside Show is now only 2 weeks away and all plotholders should have seen a brochure pinned to their gates (spares are available on the Show page). All plotholders - both novices and old show-hands - are encouraged to enter. Newcastle Allotment and Garden Show 2017, organised by Newcastle City Council in partnership with the city’s Allotments Working Group (AWG), will be held on Sunday 24th September ,all taking place in a marquee within the beautiful setting of Leazes Park, Newcastle’s oldest park, close to the city centre. Prize money will be awarded to the best exhibits on the day. There is a small charge of £3 per exhibitor and for this they can get entry into as many classes as they wish. All entrants must stage their exhibits on Saturday 23rd September between 10am -4.30pm so that they are ready for public viewing on Sunday 24th September. Mark Todd, Allotments Officer for Newcastle City Council said: This year marks the 100th centenary for a number of allotment sites across the city and we are hoping that people will show their support by coming along , to stage their produce in readiness for the public opening on Sunday 24th September. A fun filled weekend for friends and family, including entertainment, children’s activities, music, children’s crafts, face painting, raffles, stalls selling a wide range of flowers, produce and preserves, advice on bee keeping and organic gardening and much more. The public show starts at 11am, when it will be officially opened by the Sherriff of Newcastle, Cllr David Down , and finishes at 5pm. From Friday 22nd Sept through to the 1st Oct the park will be hosting a large dinosaur event, Jurassic Kingdom - Newcastle (click on link) which is expected to draw in crowds http://www.jurassickingdom.uk/tour-2/ which will add to the splendour of the weekend. 22nd July -We Want Your Fruit! 21st July - City Allotments Competition 2017. Well done, Moorsiders! Once again the expertise of our gardeners has been recognised and rewarded in the City Allotments Competition which the City’s representatives judged last week. Congratulations to Stan and Audrey Tortoise for once more fending off very stiff opposition to be awarded the top spot in the Best Full Plot with Glass category. Best Organic Plot got Moorside a prestigious 2nd place with Ann Gibson and Lat Allman’s immaculate garden. Very well done! Once more, our delightful Grow School Plot retained their 4th place in the City, so lots of congratulations to the children and parents who worked so hard on your very attractive and eye-catching Moorside plot. Last but not least, Moorside has come 3rd in the whole of the City for Best Large Site. The hard work of our gardeners and especially those of you who have helped maintain the communal areas has paid off once more. All that mowing, strimming, weeding and maintaining the colourful planters throughout our communal areas, drew particular praise from the judges, who saw our site in bright sunshine, making it look even more spectacular. Thank you all! 2017 is the third year running that we have retained this position in the face of increasingly professional competition across the 65 City allotment sites. Well done everyone for pulling out the stops in time for the judging. Let’s maintain our high standard and aim even higher for 2018! The judges would like to thank you all for allowing them through your gates to look around and judge the gardens. We thoroughly enjoyed judging and it was great to see the level of competition is still at a high standard as usual! Allotment holders never fail to surprise us with their innovative ways and quirkiness, such as water harvesting from water springs and shed roofs to recycling materials. Companion planting was at a high standard for those who are organic and the plots with glass, as always were a hard category to judge. The newcomers were of an outstanding high level and their enthusiasm was very inspiring ,considering the short time they have owned their allotment, many with no previous experience in gardening or growing. Thanks again to everyone who entered and we look forward to judging in 2018. I look forward to meeting all the winners at the City Allotments Show when I will be making the presentations to each of you on Sunday, 24th September in Leazes Park. 16th July -Moorside Alloments Competition Results June 2017. The following winning Moorside gardeners’ plots were also nominated for the Newcastle Allotment Competition, being judged by the City Allotments Officer and his team of experts during the week ending 14th July 2017. Cabinet will review progress, interrogate the financial and operational implications and decide whether or not to support further work on the charitable model. If Cabinet agree, the full proposal will be worked up to full business case and implementation plan for final Cabinet decision in October. We would appreciate it if you would spread the word to anyone that might be interested in attending and we look forward to seeing you there. Everything at half price before we close for the summer! Calling all Moorside Gardeners. Competition time is upon us once more and a small team from your committee will be coming round all plots on Tuesday 27th June to judge and select the gardens we feel should be awarded our top prize in each category. In judging the Wildlife Friendly Garden, we will also be inviting an outside expert, as we have done in previous years. Following our judging, our nominations will also be forwarded at the beginning of July to the City Allotments Officer to be considered for the Citywide Allotments Competition, which he is judging with his own team between 12-14th July. Best Organic Plot: We are not sure if anyone on Moorside is totally organic, so please let us know if you wish to be considered for this category. PS - On 27th June the internal judging will take place for our 2017 Moorside Competition Trophies and between 12th and 14th July, the City Allotments Officer and fellow judges will be coming along to judge the nominations for the 2017 City-wide Allotments Awards, including Best Site. External Boundaries Reminder - Just a reminder to all Moorside gardeners that you are each responsible for keeping your external boundaries weedfree and any overhanging branches, hedges and briars should be clipped. The recent wet and then warm weather has seen prolific growth along pathways and boundaries and if everyone sees to their own section, it has an immediate effect on keeping our site tidy. Equally important, it will also improve the visual effect for the City Allotment Competition judges when they come round between 12th and 14th July, so get those shears out, please! REMINDER - THE FUTURE OF YOUR ALLOTMENTS IS AT STAKE. Just a reminder for all our allotmenteers that you are invited to attend the annual Newcastle Allotments Working Group Forum on Thursday 15th June at 7 pm in the Armstrong/Stgephenson Room at the Civic Centre. The main subject of the evening is a presentation by the City Council on their plans for the devolvement of both parks and allotments into a charitable trust from September 2017. Your voices are very important in order to ensure the best solution for our allotment future. After the presentation, there is a Question and Answer session when you can express your concerns and get immediate answers! The evening is set to finish around 8.30 pm. PLEASE GIVE YOUR SUPPORT TO THIS EVENT BY ATTENDING. IT IS VERY IMPORTANT THAT WE HAVE A SIZEABLE PRESENCE TO ENSURE THE SATISFACTORY FUTURE FOR OUR VALUABLE HOBBY. Thank you – I hope to see you there! Reclaimed timber for Allotments, gardens, and DIY is available from Newcastle Wood Recycling, based at The Wood Yard in Walker. (NE6 2PA). They supply a variety of reclaimed timber, including pallets, scaffold boards and sheet materials. They are a not for profit organisation which was set up in 2014 to save resources and to create jobs and volunteering opportunities in the area. Intruders on Moorside - During the course of Monday night – we think we have pinned it down – it appears that intruders entered the site and opened a selection of shed doors at the top of the middle lane and down the west lane. There were also one or two sheds opened down the east lane but not as extensive. Damage seems to be minimal if any and although things have been taken from several sheds, many of the ‘spoils’ have been found either on the pathway or left in other plotholders’ gardens. However, there are some items which have not been recovered, so if you find things on your plot which don’t belong to you, please bring them down to the shop over the weekend between 10 am and noon and we will try to repatriate them with their owners! Similarly, if you find items missing, please report to the shop also. Due to unforeseen circumstances, the planned open day at Coxlodge allotments planned for 20th may has been cancelled. Thank you for taking the time to share your views on the future of Newcastle’s parks and allotments. We are grateful to everyone who sent us their views, including taking part in the online consultation, drop-in sessions and workshops. Newcastle City Council is currently analysing all of the responses. As there are restrictions in place on the information that councils can publicise during a pre-election period, we will be providing feedback after the General Election which is on 8 June. The consultation findings will be published on Newcastle City Council’s website: www.newcastle.gov.uk. The consultation is now closed, but if you have any further questions or feedback, please email: letstalk@newcastle.gov.uk. The 2017 Allotment forum will be held on 17th June at the Civic Centre. More details can be found here. The skip is now full - please don't attempt to put any more rubbish in as the company won't collect if it's over-loaded. Metal (this can be left tidily and safely behind the trading hut to be collected by our local scrap merchant). Any substances which are deemed notifiable eg. Asbestos. If you find anything of this nature, please get in touch with a committee member immediately and we will arrange safe disposal with the Council. Finally, please load the skip sensibly and empty out plastic bags into it rather than piling them up full. It takes less room! 1st April - Greening Wingrove & The "Future of Newcastle's Parks Consultation"
We have already posted on the website the details surrounding the possible devolved management of the City’s parks and allotments to a charitable trust. I hope you have had an opportunity to go along to some of the sessions which have already taken place to learn more of the proposals. If not, and bearing in mind many of our gardeners fall within the Wingrove Ward, Greening Wingrove has arranged two special sessions at the Civic Centre on 5th and 6th April. Councillor Nigel Todd has outlined the details of the sessions below and has issued an open invitation to you to attend. This is your opportunity to have your say, especially as to whether you agree or disagree that the proposals should include allotments. Do try to get along. As you may know, the City Council is looking at the possibility of moving the management of the City’s parks (including Nuns Moor Park) and allotments to a ‘Parks Trust’. There is little detail as yet, but several consultation events have been held. The Greening Wingrove CIC strategy group that is looking at the future of Nuns Moor Park, as part of our work underway to set up a Friends of the Park group, is also seeking to shape options for how our local park could develop in the future. If you would like more details, please get in touch. Heaton Park – Monday 24 April, 5.30-6.30 pm. Just turn up at the Parks, or contact Andrew Teasdale at the WEA Greening Wingrove Project for details (e: ATeasdale@wea.org.uk). 1st April - Compost Ahoy! With spring coming, and by popular request, Frank's guide on the various ways to keep on top of the inevitable wave of slugs & snails has been republished from the 2015 Newsletter on the Wildlife page. Our allotment shop is now back to summer opening with immediate effect. We are now open from 10 am to 12 noon on Saturdays and Sundays. To aid your seed planting we have got in a new supply of Humax Original with silver sand as well as our usual multi-purpose and organic varieties. We have also taken delivery of another huge load of farmyard manure which is still selling at £1 a barrow. A new consignment of paraffin has also been delivered today but for the first time in our shop history we are having to put the price up to £1.20 a litre or £4.80 for a 4-litre can. We have absorbed increased ‘wholesaler’ prices up to now but have reached a point where we are having to pass them on. On the plus side, however, our paraffin prices are still way below outside retailers, which is why our sales are so good. Just a note too, that the water will be turned back on before the end of the month if the current mild weather continues. Bearing in mind that the stopcock for our supply is on the moor adjacent to our site, we intend switching it back on before the cows return for the summer season on 31st March. We had a very serious break-in last night with equipment and cash taken. The police have been called and I have been on site most of the day with several other Moorsiders trying to sort things out. It seems from what we have seen and from initial reports coming in from some of you that the intruders have been through the whole site, breaking open sheds, wrecking furniture, kicking down fences amongst other things. In relation to sheds, we have not heard of anything having been taken to date. Even our red letter box by the main gate had been forced open. To make sure the police have the full inventory of stolen goods and damage, please could each of you go down to your Moorside gardens as soon as possible and just check things over. Should anything be missing or if you want to report damage etc, we have an Incident Reference Number 429 and a Crime Reference Number dated 6th March – 024351P/17. The Police Officer who came down was PC 670 Lindsay from 2417 Response Team. You can reach him by dialling 101, and he would like to hear from anyone who has been a victim of this burglary, especially if goods have been taken. The equally alarming thing about all this is that the east gate was wide open this morning with the undamaged security lock clicked shut, indicating that the thieves had an entrance key to our site. If anyone has recently lost a gate key, please let any of the Committee know. Right now, it is a possibility that entry was made simply by unlocking the gate, making it much easier to wheel the generator and any other equipment out of the allotments. 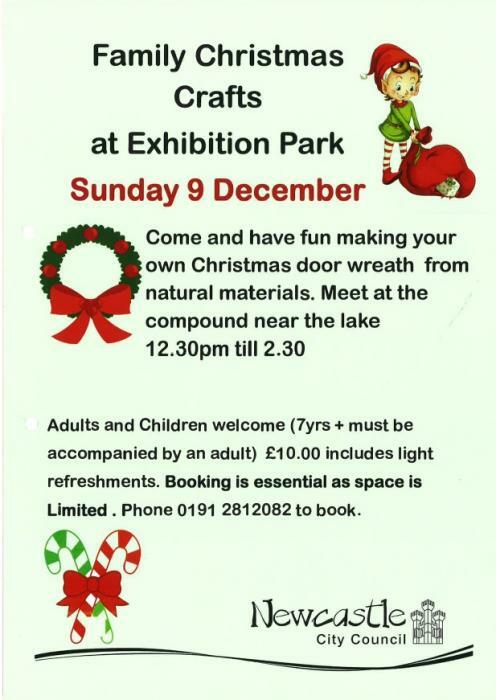 We are pleased to take part in a raffle organised by the Newcastle Allotment Group. A few tickets are left but the raffle must end this weekend (4th and 5th March). Give it a go! And good luck! A revised trading hut rota is also available for those brave souls manning the trading hut through the cold weekend mornings - new volunteers always welcome, bring your own gloves. If your new years resolutions involve having a clear-out, then the Moorside Jam Mafia are keen to help recycle any patterned cotton shirts, blouses etc (which can be recycled as jam pot covers); and well as any frozen fruit lurking in the bottom of your freezer. Any material can be dropped off at the Trading hut; or pop over to our trial Facebook Group (you'll need to request to join and have this approved first) to arrange any donations. We were very sorry to hear of the death of former Moorside gardener, Ben Rudden. Ben and Jean worked plot 30 for many years and even since he ‘retired’ from the site, they have both been loyal supporters of our plant scheme, the shop and the annual show. When Ben left Moorside, we were delighted to make both he and Jean honorary members of our site. The funeral is being held at 10 am on Monday 19th December at St Robert’s Church, Bolbec Road, Fenham. As winter approaches, the site water supply will be turned off and drained this weekend and won't be turned back on next spring; which also means that the toilets will be closed until the spring as well for reasons of hygiene. .
With the 2016 season drawing to a close and gardeners busy digging over the ground in readiness for next year, we are pleased to focus your minds even more on next season’s planting! The 2017 Kings Seeds catalogue is now available either from the Trading Hut during opening hours or just take one from inside the notice board cases at the East Gate and the Main Gate. As usual, Dave Vincent has kindly offered to co-ordinate orders, so complete the form and put it in an envelope marked Kings Seeds FAO Dave Vincent. All orders must be accompanied by payment in advance, with cheques being made payable to Moorside Allotments Association. Either deliver it to Dave on Plot 8, drop it off at the Allotments Shop or post in the red letter box (secure) by the main gate. Kings Seeds pass back up to 17% of the value of all orders, which goes to our Allotment Association, so your support benefits everyone. To save you postage, Dave will have all orders delivered to him in bulk for collection from the Allotments Shop. We’ll let you know when your order comes in. Please could you make sure your orders are delivered to Dave on plot 8, the allotments shop or posted in the red letter box no later than 29th October 2016. We have also received our 2017 batch of vegetable seed, potato, flowers and fruit catalogues from Thompson & Morgan. The orders are being co-ordinated by the Shop Manager, Susan Pownall and the catalogues are available from the shop NOW! There is a 50% discount on seed orders with free postage. Plant orders qualify for a 20% discount but you pay postage. Once again, completed order forms – with your name and address - and remittance should be dropped off at the shop marked THOMPSON & MORGAN ORDER. FAO SUSAN POWNALL. Or, outside shop hours, please post in the red letter box by the main gate. When enclosing your remittance, please ensure you have deducted the appropriate discount, which benefits you personally. Please make cheques payable to Thompson & Morgan. Orders must be received at the Allotments Shop by 30th November 2016 at the latest. All Thompson & Morgan seed orders will be delivered in bulk to Susan, who will let you know when they are available for collection from the Allotments Shop. Non-Seed orders will be sent to you directly from Thompson & Morgan at the correct time for planting. We advise you keep a copy of your order form for future reference. It is with great sadness that I learned this afternoon that Peter Whewell, our former Chairman and dear friend, has died earlier today after a brave battle with cancer. His wife Liz said he died this morning at home, where he wanted to be at the end. As Liz said “I know for Peter it was time to go and he died peacefully in his sleep.” Like Liz, I am sure that all who knew him will miss him dreadfully. His dry sense of humour and endless energy, as well as his ability to keep us all on our toes on the allotments will contribute to the lasting memories of a great man. Peter had been Chairman of Moorside Allotments and also a key member of the Newcastle Allotments Working Group for a number of years during which time his professionalism, enthusiasm and intellect saw many positive changes not only to our Moorside allotments scene but also across the city. His input into the Allotments Strategy for the City has helped to raise standards and sustainability in a pastime which we all enjoy now and hopefully well into the future. 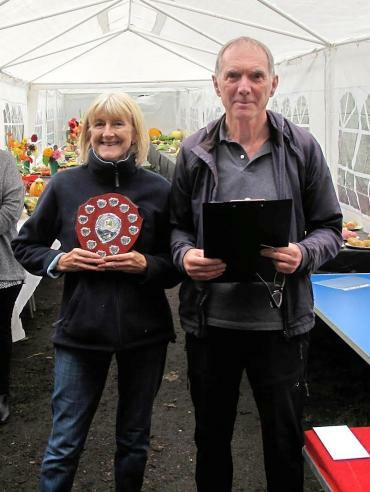 Peter and Liz maintained a wonderful garden on Moorside and won many top awards both in our own annual Moorside Allotments Competition and in the annual City Allotments Competition. Peter’s efforts also saw Moorside win Best Large Allotment Site in the City as well as several second and third places over the years. Peter has been an example and inspiration to us all and will be sadly missed. If people would like to make a donation, Peter's charities were The Mountain Bothies Association and The John Muir Trust which is dedicated to protect wild places, they care for and own Ben Nevis, Scheihallion, Sandwood Bay, amongst many others, donations can be made on the day. The wake will take place after the funeral at The Northern Football Club, McCracken Park, the Great North Road. 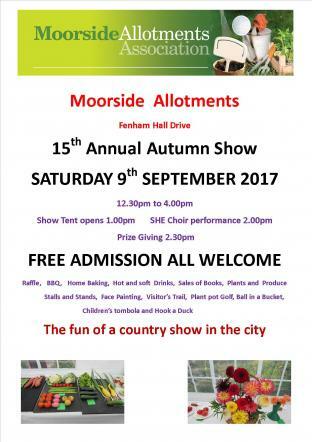 The 2016 Moorside Show is now only 2 weeks away (12.30pm Saturday 10th September), and the entry brochure is now available to download here, with the printed version available very soon at the allotment gates. Please be aware that entry slips for the show must be received no later than 2pm on Friday 9th September. The show organisers are also looking for Exhibitors, donations of Raffle Prizes, Cakes to sell, Books/CD's/DVDs, Jams & Chutneys etc - see the poster for more details. This trip is only for members and non-members of the national allotment society and friends. Advance payment required with booking. Cheques preferred. This is not refundable except if there is insufficient support when all applicants’ cheques will be returned. The bus will start from somewhere north of Newcastle depending on demand at 8.00 am sharp on Sunday 18th September. Exact start point and pick up points will be notified with the acknowledgement. There will be a maximum of 4 pick ups. Full details on tickets. Drop offs on return will be the same as the pick up points. The bus will leave the show ground bus park at close of show, 4.30pm sharp. A message from your Chairman. Once again, Moorside has proved to be one of the most attractive sites in the city, coming third in the Best Large Site category for the second year running. Despite the late start and some adverse weather conditions, the majority of our allotments looked spectacular with masses of produce and colour. Not only that but we have picked up a further four awards in the competition categories, which were all judged during the first week in July. Well done to our selected gardeners! All this is down to you, our allotmenteers but also I would like to extend an extra special thank you to all the ‘invisible’ volunteers who cut the grass, trim hedges, weed borders, cut back briars and branches over paths, fill the planters and communal flower beds, de-weed the paving stones and all the other jobs that go on to make Moorside such an attractive allotment site and also go a long way to ensure our place on the City Allotments Competition podium! Thank you all for allowing us to visit your sites and to those of you who took the time out to show us around a big thank you. Despite the slow start to the growing season the stand of crops in comparison to when we last undertook the role as judges has increased in quality and variety. We found it fascinating that allotment holders have a unique knack of being innovative in utilising space for crops and wildlife along with the fantastic ways of recycling materials! We loved some of ways in which allotment holders are utilising water harvesting and the number of ponds on sites was great to see, as well as the living roofs!! Some ideas we’re sure we will take forward to use elsewhere in the city. We were amazed at the level of work in the Newcomers category and how quick they are getting returns for their hard work. Some of the more established plots failed to disappoint – especially those with glass. A number of sheds prove to be home from home and I we would recommend the suggestion for best shed / allotment holders retreat to be forwarded as a new category for next year. Thanks again to everyone who entered and we look forward to judging all the plots in 2017 which is a centenary year for a good number of sites across the city. It was a pleasure judging. Budding gardeners and green-fingered enthusiasts are invited to show off their gardening skills at the annual Newcastle Allotment and Garden Fete (as it is held outdoors this year). Newcastle Allotment and Garden Fete 2016, organised by Newcastle City Council in partnership with the city’s Allotments Working Group (AWG), will be on Sunday 25th September, all taking place in a marquee within the beautiful setting of Leazes Park, Newcastle’s oldest park, close to the city centre. The event promises a fun filled weekend for friends and family, including entertainment, children’s activities, music, funfair rides, circus skills, children’s crafts, raffles, stalls selling a wide range of flowers, produce and preserves, advice on bee keeping and organic gardening and much more. The public show starts at 11am on Sunday 25th September, when it will be officially opened by the 800th Lord Mayor of Newcastle’s Mayoralty and Burgesses (better known today as the Freemen of Newcastle). Over the years these valued institutions are credited with giving Newcastle stability, social cohesion, justice, law and administration. The city’s allotment and gardening tradition is testament to the community spirit embedded in our cultural heritage. To honour this important anniversary, Lord Mayor Councillor Hazel Stephenson will open the 2016 Newcastle Allotment and Garden Fete and will also be involved in judging some of the exhibits. 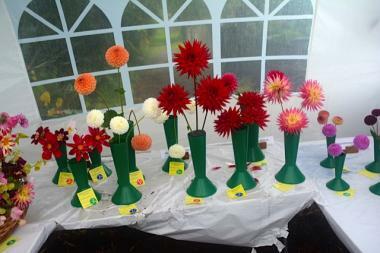 If you are wondering whether it is worth entering the Allotment Show as an exhibitor, it is. We need to promote and showcase allotments in Newcastle and this venue is the best place to do that. National Allotments Week exists to highlight how brilliant allotments are. They not only bring communities together, provide space for growing and fresh air for individuals and families alike, but they benefit wildlife and help to keep our cities breathing. 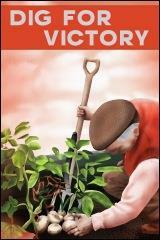 National Allotments week commences 8th August through to 14th. NSALG are asking sites to throw a party following last year’s success. For more information go to NSALG‘s website. It’s that time of year again when all our plots are inspected, with the help of an external judge, to find the most outstanding gardens in a variety of categories. For our seasoned gardeners, you will have been building up to this event all year, finding every weed, making sure your external boundaries are clipped and tidy, clearing rubbish from behind the shed and most of all, bringing on that wide variety of flowers and vegetables, all adding to the WOW factor! For those of you who have not been on Moorside very long, there is a chance for you to shine too, so don’t be put off – just look at the list of award categories below. How about striving for Best Newcomer? The judges will be making their decision on 28th June 2016, so we all have a few days to make our gardens look as appealing as possible. These are the categories our judges will be seeking to put a winning name against and it could be you! The worthy winner in each category will receive an award at a special ceremony at our Moorside Show on 10th September in recognition of their achievement and all their hard work. The winning gardens of our own Moorside Annual Awards will also form the basis for consideration in the City Allotments Competition 2016, which is judged by the City Allotments Officer and external gardening experts. This judging is taking place between 5th and 7th July 2016. You will have seen from the website and the notice boards how well Moorside did in the 2015 City Competition, with 1st, 2nd and 3rd places in several categories. Of special importance was Moorside Allotments achieving third best site overall throughout the City, in which there are now 65 allotment sites all competing for that top prize. Can we do better this year? Yes we can – if we all pull together to make each of our gardens, perimeters, hedges and fences look the best in town! A revised Trading Hut Price list is now available here listing everything you need to dig, clear & grow; a revised rota for manning the Trading Hut is also available - more volunteers always wanted! Unfortunately the skip is now full - please don't try to add anything further to it (or dump anything next to it) or the entire skip may be classed as overloaded and may not be taken away. The water is now back on, and bonfire season is now coming to an end; please don't light any fires after Thursday 31st March. The Easter skip is being delivered tomorrow (24th March) for plotholders to dispose of rubbish. Please note: the skip is not for wood (to be burned), weeds (ditto) or tyres. Scrap metal (but not gas cylinders) can be placed behind the trading hut for the scrap man. Anyone caught breaking these rules will be composted. The latest Trading Hut Rota has been added. As ever, new volunteers are always welcome! Greening Wingrove are running a session on the 10th February to begin "creating a north east food-growing guide". Slightly late (blame the web-monkey), but the November committee minutes are now available to read here. Northumbria Police have been in touch and have requested that our allotment gardeners should be made aware that there have been a number of break-ins on allotments in the Gosforth area. However, they feel all sites across the city need to be on their guard and if plotholders have anything of great value they suggest it should be taken home. There has been a lot of damage done by the thieves trying to break into the sheds so it is suggested if possible that they are left unlocked. However, this is entirely up to you. If you do see anything suspicious then please contact the non-emergency line on 101. The Annual General Meeting for 2016 will be held on Wednesday 27th January at 7.30pm. If you have supplied an email address you will receive the agenda, chairman's statement, rent form and last year's minutes to your email shortly. The Trading Hut will be taking delivery of seed potatoes in January/February (depending on weather conditions), for more information, visit the Trading Hut pages: Book early to avoid disappointment! The Trading Hut will be moving to winter trading hours from 27th December: Until approximately mid-February, the Trading Hurt will only be open from 11am till midday Saturday & Sundays; the full range of stock remains on sale, and a new price list is now available. An updated rota is also available here. Finally, anyone who has picked up the 2016 Thompson & Morgan Seed Catalogues from the Moorside Shop over the past few weeks: please note that we need your completed order form and payment (made out to Thompson & Morgan Ltd) returned to the Moorside Shop no later than 12 noon on Sunday 20th December 2015. This deadline enables us to place our bulk order with the company in time to receive our substantial discounts on both seeds and plants, as well as free delivery (on seeds). The October Committee minutes are now available on the committee page or click here. With the expected cold snap this weekend, the water supply will be turned off tomorrow until late March / early April (once the threat of frosts drops off) and the pipes drained down to prevent frost damage. This also means the on-site toilets will be closed as well until the spring. 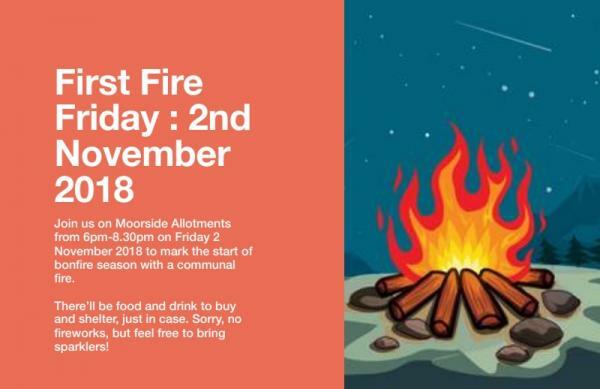 2nd November - Greening Wingrove News & Free Pizza! Greening Wingrove have been heavily involved in the organising of the "Back to the Land IV" conference next Saturday (7th November) in Jarrow - more information can be found on the new Local Events page. Don’t light your fire when the wind is blowing towards local residents’ properties or likely to cause a thi ck haze across the main road. Try to choose a dry day when the material you are burning is not too wet and therefore likely to create lots of smoke. Make sure your fire is extinguished before you leave your allotment. Remember that burning of plastics and treated wood is not allowed as both give off noxious fumes. Consider our wildlife and make sure there are no little creatures, especially hedgehog, living in your bonfire heap. Water Supply - As a general rule, we turn off our mains water supply at the main stopcock on Nunsmoor at the end of October. This is done to avoid any damage to pipework from the frosts. The system is drained, taps are left open and the toilets cleaned and closed up for the winter. If the weather is mild, as it has been this year, we might leave the water on for a little longer but we keep an eye on the forecasts and take immediate action to avoid problems. Therefore, should gardeners wish to fill water butts etc, please do so before the end of October, to be on the safe side. Autumn Skip - Twice a year at the beginning and end of the season, we organise a skip to take away selected rubbish from our allotments that cannot be burned. We are expecting our autumn skip towards the end of October, so keep a look out for the notice that Krys, our Secretary, posts on each of the entrance gates with updated information, including items which are not to be ‘skipped’. For instance please remember that the skip is not the place for importing off-site domestic rubbish, nor is it acceptable to dispose of wood, tyres, weeds, hedge cuttings etc on it. Please empty plastic bags into the skip as loose rubbish takes up less room. Metal can be heaped tidily behind the trading hut and we get a local scrap merchant to take it away. Finally, please do not overload the skip. Once it is full, you will invariably see a polite notice to that effect on the side. The suppliers can refuse to take it if it is too full, so please help us in that respect. Newcastle Outer west are running a surplus produce swap & share on Saturday 17th October, more information available here. We've also had a request from Keiji Makino who is currently studying for a PhD at Newcastle University. 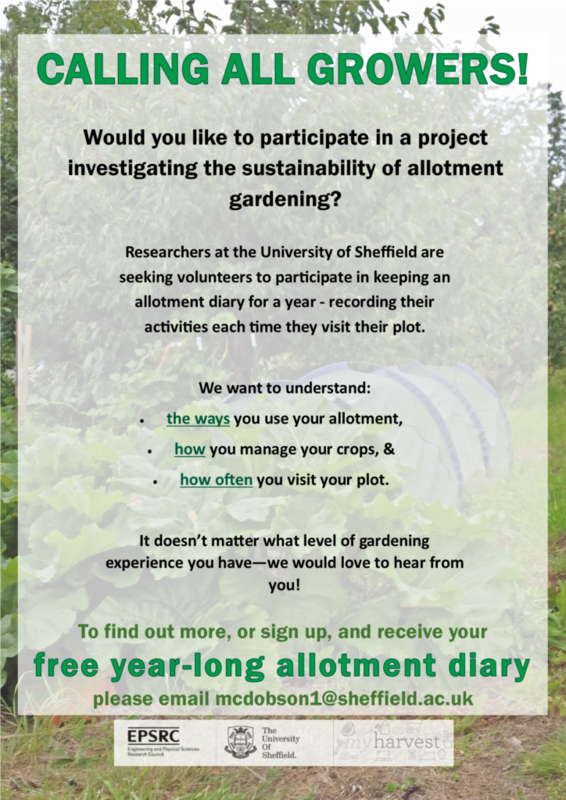 The study will focus particularly on the allotment gardens and allotment Communities, their activities, values, concerns and prospects, and Keiji would like to obtain plot holders’ opinions and stand points over the allotment gardens. Click here for the survey form. Finally the latest Trading Hut rota is now available - new volunteers are always welcome! Speak to Susan if you're interested. 6th October - 2016 Kings Seeds & Thompson & Morgan Seed Catalogues Now Out! With the nights drawing in and the garden winding down for the winter, the Kings Seeds, and Thompson & Morgan Seed Cataloges are available. For more information head over to the Trading Hut pages. Both catalogues are available from the trading hut now, so get planning out your 2016 growing! 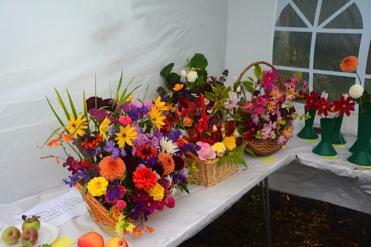 1st October - Moorside annual show: September 12th - Thank You Everyone! 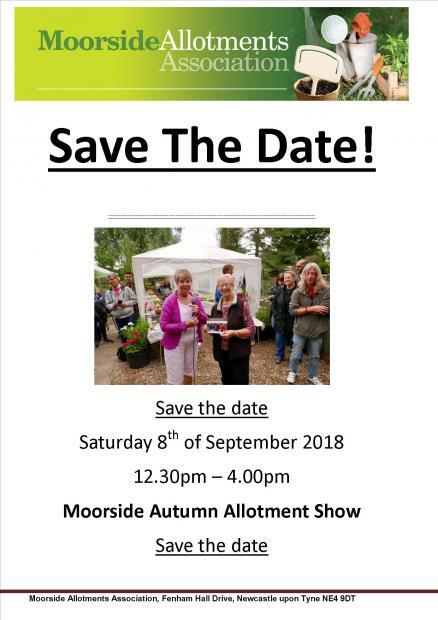 Our Moorside Annual Show is one of the highlights of our Moorside Allotments year and a lot of work goes into its organisation to ensure the event is enjoyable for all our visitors and gardeners alike. I would therefore like to thank everyone concerned in making sure our 2015 event carried on the high standard, despite the dreadful weather. First of all, a big thank you to the small show group whose regular meeting started very early in the year and who co-ordinated the show brochure, annual award trophies, obtained prestigious raffle prizes and sought support from interesting show stands, amongst a host of other detailed tasks. Thank you to the team of volunteers who put up the roof cover, marquees and gazebos, set out the show tent to house the competition exhibitors and even provided an invaluable PA system so we could all hear what was going on. Another annual attraction is the FOOD! The barbecue team Krys and Paul Gaffney never fail to disappoint with their grilled selection, while Nicky Walter and her team bring us a steady stream of drinks and tasty savoury and sweet delicacies donated by our gardeners and Association friends. Thank you to all our stall holders who weathered the storm to man the welcome table, the varied stalls selling books, plants, jams and chutneys, artworks and conduct face painting. And of course, admiration must go to the many gardeners who, despite a very strange year weatherwise, managed to produce a wealth of exhibits for our annual competition. Finally and most importantly, thank you everyone who turned out as a guest in the pouring rain, ensuring another successful event. We hope you enjoyed it as much as we did! A report of the show with a list of prize-winners and lots of images can be viewed separately on the website soon. We've also been made aware of a planned Lifelong Learning even can be found on the News page. News and photos from the City and Moorside shows are coming soon once everyone dries out. 2nd September - City Show this weekend! Don't forget it's the City Allotment Show this weekend: The show organisers are looking for any surplus fruit / veg or flowers that can be donated to sell on stalls. 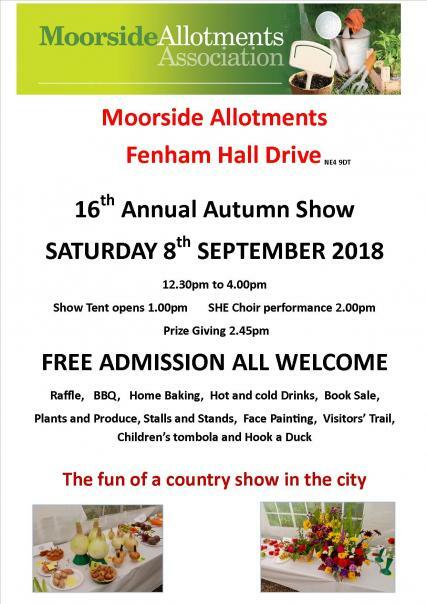 It would be great if we could all help supply the organisers (the Allotment Working Group) with produce on the day of the show to sell to the members of the public. The money raised enables the group to support small projects on allotment sites throughout the year. Please deliver any produce to Westgate Centre for Sport , West Road , Newcastle on Saturday 5th September throughout the day (but no later than 4pm) or on the day of the show, 6th September before 10.30am. The café will be open on both days selling a range of sandwiches / fresh cakes /scones teas & coffees and more . The bi-annual Newsletter is now available to read. Many thanks to everyone who have helped make this happen! “Silly season” has drawn to a close but there is stock available for late summer planting. Planting fruit bushes is best done during late summer/autumn and spring. We have several redcurrant and gooseberry bushes. They are thriving in the ground and can be supplied as bare rooted plants for immediate planting. Some perennials and biennials are being grown on, but we currently have dwarf wallflowers ready to plant out. 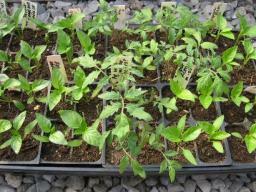 We also have chilli plants which can be kept in a warm place including a kitchen window sill. Stock will also be available at our autumn show. September is an “in-between” time for plants but is also the time for house plants. If anyone has unwanted house plants, or cuttings, please let Sue know via email, pop a message in the red post box beside the middle gate or bring them to the shop area during normal trading hut hours. (Please do not leave plants outside). The Trading Hut have just taken a delivery of a new kind of peat-free compost "Silvagrow" which is favoured by a number of professional growers. Stocks are limited so get in quick. There's also been a delivery of free woodchippings for paths, walkways etc by the trading hut. First-come first-served, but it's hoped further deliveries will follow. Work is continuing on the mammoth task of making jam for the Moorside show in September (work-in-progress action shot at the right hand side); and Beverley is still looking for donations of fruit and 1lb jam jars (see the Offers & Wanted page for more information). Coxlodge Allotments are holding an open day on Saturday 15th August (12-2pm) to showcase the changes that have taken place there as a result of recent U-decide funding (which have led to creation of new facilities including a classroom, composting toilet and community plot). The official external judging for the 2015 Newcastle Allotments competition took place during the first week in July and we learned from Mark Todd, the City Allotments Officer, that the standard across the city has improved beyond expectations over the past few years. Such excellence makes the judging much more difficult although with a formal list of criteria to work with, the adjudication process is helped enormously. It is with great pride that we are able to report once again Moorside’s very own Stan and Audrey Tortoise’s success in retaining the top spot across the City in the Best Plot with Glass category. Many congratulations! Your garden is always a joy to look at and reflects the hard work put into it. As an association, Moorside Allotments also came back into the top three sites overall, after a lapse in 2014, coming third in the City’s Best Allotment Site category. Well done to our gardeners for setting a standard. The complete set of results is available here and the list has also been posted on all the Moorside notice boards. We will also be bringing you more pictures and editorial in our next Newsletter, coming out shortly. The trophies will be presented to the winners at the City Show which is being held at the Westgate Centre for Sport on the West Road on Sunday 6th September - details coming soon! 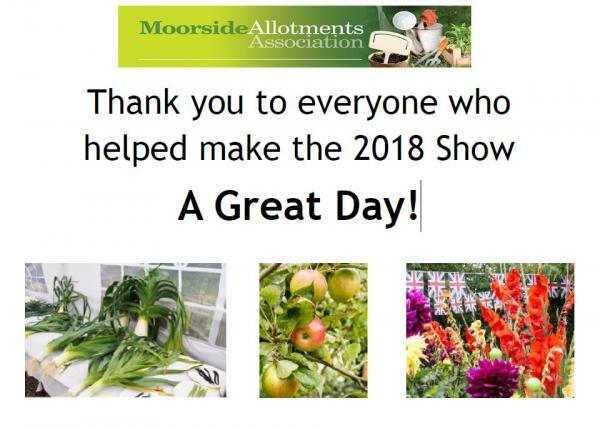 Whether you would like to take part as an exhibitor of fruit, veg or flowers or would like to join us as a visitor we would be pleased to see you at the Moorside Annual Show on Saturday 12th September. Brochures which include an entry form to place exhibits will be available shortly. Also soon to come will be extra copies of the entry form deposited in two of the notice boards and to collect from the Shop during normal opening hours (10am to noon each Saturday and Sunday). The Shop team are pleased to report that our 2018 seed potato order was delivered from our wholesalers today. We have a variety across Early, Second Early and Maincrop and all reasonably priced at £2 for a 2 KG net. We can split a net, if you only want 1 kg. They will be on sale in the Moorside shop from Saturday 27th January, so come along and bag your favourites – they always sell out so fast due to the VERY reasonable prices.